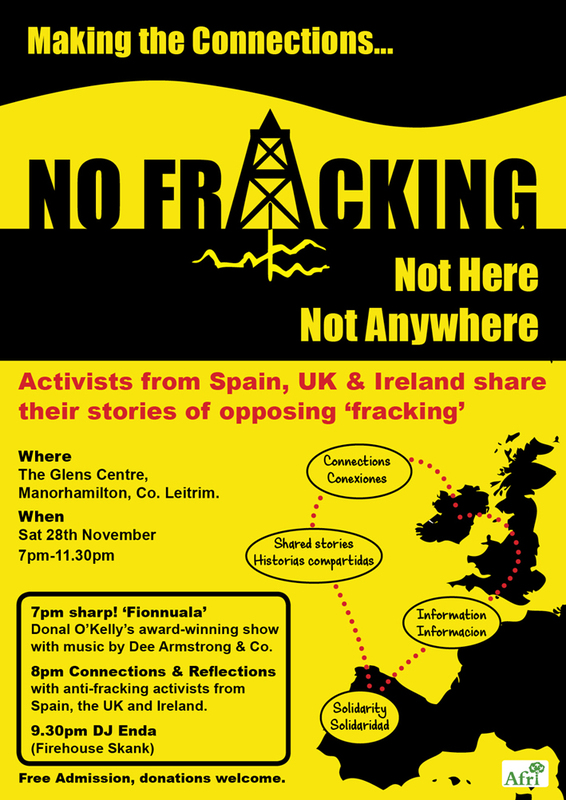 Making the Connection, Fracking No!, an international gathering of anti-fracking activists, in the Glens Centre, Manorhamilton, Co. Leitrim, 7pm-11.30 pm Saturday 28th November. A panel discussion comprising of speakers from Burgos, Cantabria, England and Ireland will follow with DJ Enda of Firehouse Skank finishing off the evening with reggae beats. The idea for Making the Connection, Fracking No! was born out of a visit to Frackanpada 2015 in the Basque Country in July by Leitrim-based anti-fracking activist Caitriona Kelly in which over 400 international activists and campaigners from over fifteen countries gathered for a week of workshops and talks. This event has been organised in collaboration with Afri and is supported by Love Leitrim. A unique blend of conversation, debate, music, fun and food! For more details please download the brochure here.